The Northern Circuit is a 3-day tramp/hike starting on Mt. Ruapehu and encircles Mt. Ngauruhoe. The circuit can be started from different points and walked in a clockwise or anti-clockwise direction. The Tongariro Alpine Crossing track will showcase explosion craters, lava flows, Tama Lakes, Taranaki Falls and the Rangipo and Otarere deserts are explored on this trek. This trek is a good way to enjoy the Tongariro National Park at a less energetic pace, whilst avoiding the crowds of the Tongariro Alpine Crossing. Mt. 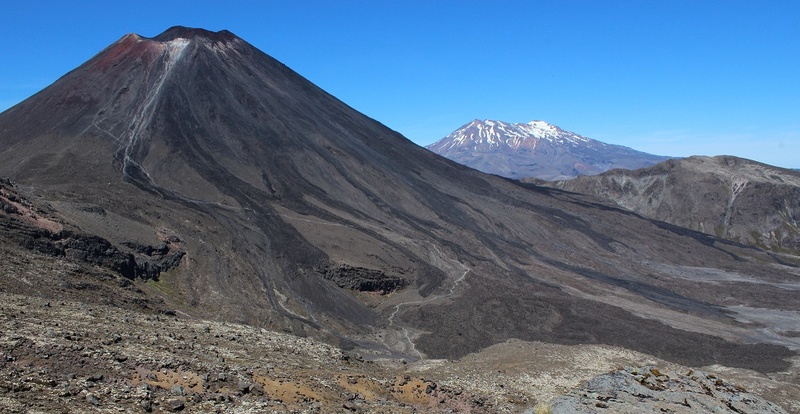 Ngauruhoe had sporadic action during its last eruptions between 1973-1975. Since 1839, Ngauruhoe has erupted 61 times with breaks lasting no more than nine years (until 1975), and it is this regular activity that formed the perfect symmetry of its cone shape. You will be required to carry minimal group equipment along with your own personal gear unless you request a porter (additional charge applies). Your backpack should not be carrying more than 10-12kg in weight. Guide/s, transport between the Adrift Tongariro base and the activity, Department of Conservation hut or camping passes, all meals (vegetarian available on request at time of booking), nourishments and basic needs whilst on tour. Adrift Tongariro also provide all cooking and camping equipment. Trip departures available all year on application and confirmation. Summer (1 October - 30 April), Winter (1 May - 30 September). Northern Circuit return transfers work in conjunction with Tongariro Alpine Crossing return transfers which can affect return times. Walking boots, socks (2 pairs), walking pants or shorts (not jeans), a waterproof rain jacket, 2-3 thermal or fleece tops, 50L backpack, 1.5L water container, walking poles (optional), sun hat, warm hat and gloves, sunglasses, suntan lotion, personal medical needs including blister tape and toiletries and personals for 3 days. For the hut at night: Sleeping bag, 1 set of spare pants, top and light footwear (crocs), head torch, a small book, cards or other if you want to relax at night. Please be careful not to pack too much but please feel free to bring with you what you think you may need and we can scrutinise and advise that which we think is superfluous to requirements. This can then be stored securely at our base.